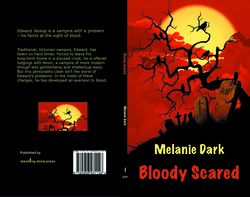 BLOODY SCARED is a humorous vampire novella. The print version is written under my pen name of MELANIE DARK to distinguish it from my literary/general fiction. The kindle version is now republished under my own name. Edward Jessop is a vampire with an embarrassing problem – he faints at the sight of blood. Traditional, Victorian vampire, Edward, has fallen on hard times. Forced to leave his long-term home in a disused crypt, he is offered lodgings with Kevin – a vampire of more modern but less gentlemanly and intellectual persuasion. But this personality clash isn’t the worst of Edward’s problems. In the midst of these changes, he has developed an aversion to blood. To further complicate matters, Edward accidentally sires Elizabeth - and then proceeds to fall in love with her. BLOODY SCARED - Chapter 1. He had been following her for about ten minutes. Ever since she came out of The White Horse with a friend and the two girls had set off down the road, laughing and chatting. They were so engrossed they didn’t seem to notice him. Which was all to the good. At the crossroads they paused and hugged one another before continuing alone in opposite directions. He had a dilemma now: which to choose. He didn’t like fights and struggles with scratching and kicking. That kind of thing wasn’t his style at all. So he opted for the shorter, more slightly built of the two and trailed her silently. There was a faint drizzle in the air; not enough to call rain, not the sort of weather that would tempt you to take a taxi home; but enough to dull the night sounds, to soften footsteps beneath dripping trees. It was perfect weather, in fact, for what he had in mind. He kept a respectable distance behind as he followed her down the road. As they left the town centre, the bright take-aways and glazed shop fronts dwindled and the road widened into an avenue lined with birches. Beneath the canopy of the trees, he blended into the shadows. She was maybe twenty yards ahead, far enough to be oblivious to his presence. When she turned into the churchyard he couldn’t believe his luck. On a summer’s day it was a sanctuary from the bustle of town. Shoppers with aching feet and office workers on their lunch break would sit on the benches and picnic on the closely mown grass beside the church. Or so he remembered. But the absence of light transformed it. The cold, shimmering glow of the moon only served to make the shadows darker, the gravestones more gaunt. No matter how many crucifixes were carved into stone, by night this would always be the domain of the dead. She followed the path furthest from the church; the one that people used as a short cut: the one flanked by ancient yew trees with their darkness and deadly poison. He was sure she hadn’t seen him. He could take her anytime. Step in front of her, pin her arms to her sides, reach for her neck. And it would be over. But he didn’t want it to be like that: to see the terror in her eyes, to finish the job quickly just to silence her scream. He wanted her to enjoy it: to give herself willingly. ‘And I’m Edward.’ He bowed slightly. ‘Elizabeth. What a lovely classic name.’ He took her arm. He’d expected her to be a Lee-Anne or a Tracy. Nothing wrong with those names of course, except they were so modern, he couldn’t really relate to them. Whereas, Elizabeth was a name he could whisper softly as he breathed in the scent of her hair. They were approaching the darkest point now; where the path forked into a Y shape, shrouded by the branches of three ancient yews. After that, the streetlights would glare in the distance; it would be too late. It was now or never. He turned and pulled her close, pressing his lips against hers. She tasted of red wine, sweet and classy. At first she seemed surprised and he thought she would try to pull away. He hoped not. He was a gentle man; he wanted this to be easy for her, as easy as it could be. But then, suddenly, she was kissing him back and he softened his grip a little, working his lips across her cheek, her ear, her hair. He tasted the perfume on her neck; let his tongue linger on the softness of her skin. The inescapable urge was welling up inside him now. It was an instinct: a force that was animal; that transcended evolution. And she was encouraging him in a way that he couldn’t refuse: a way that she was too innocent, too trusting to understand. Moving down, towards her clavicle, towards the warmth of her body, the climax was close. Suddenly he could hold himself back no longer. With his teeth, sharp against her skin, he bit into her flesh. When she cried out it was not a scream of pain but a release, a triumph, a satisfaction that no man had brought to her before and none would again. Then she fell limp in his arms. As her head drooped away from him, her blood glistened in the moonlight, like a spilt glass of Burgundy oozing from the wounds and pouring over her pale skin. He looked at it for just a second. And then he passed out.